Data Dez joined the Dataman Group Team in May, 2015. 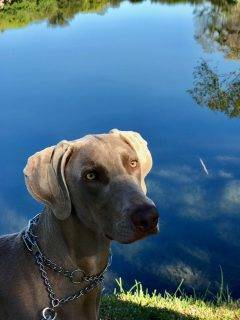 He was born on March 30, 2015 and faced a rigorous training schedule developed by Chief DataDog, Kobe, and Senior DataDog, Kaycee, who took little Dez under their wings and to show him the ropes. 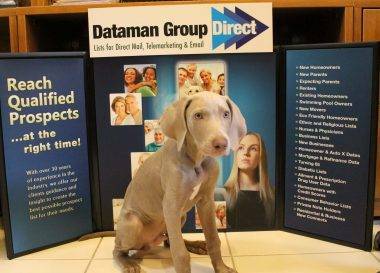 He became a full-fledged member of the World Famous Dataman Group Datadog Team when he recently turned 2, at his birthday pawty, surrounded by friends and family. Data Dez is a bundle of energy who provides the entire Dataman Group staff with a lot of entertainment. He is quick to notify us when a car pulls up to the Dataman Group offices, very protective of our staff and, as such, we have promoted him to Head of Security. Data Dez also makes sure to sniff all staff and visitors thoroughly, to insure they meet his exacting standards before allowing them entrance to the office suite. Every day at lunch, Data Dez and Data Kaycee are rewarded with a special treat to get them through their busy days. Data Dez Graduates. 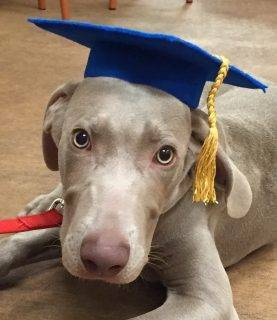 You can see from the tassel on his Graduation photo that he has passed his first tests!